When I heard that The Kensington Hotel in West London had collaborated with Disney on an exclusive themed afternoon tea called the ‘Tale as old as Time’ I was gutted to find that it had been sold out super quickly. However, I was surprised with a reservation and got to experience the afternoon tea at the luxurious Kensington Hotel a few months later much to my delight. 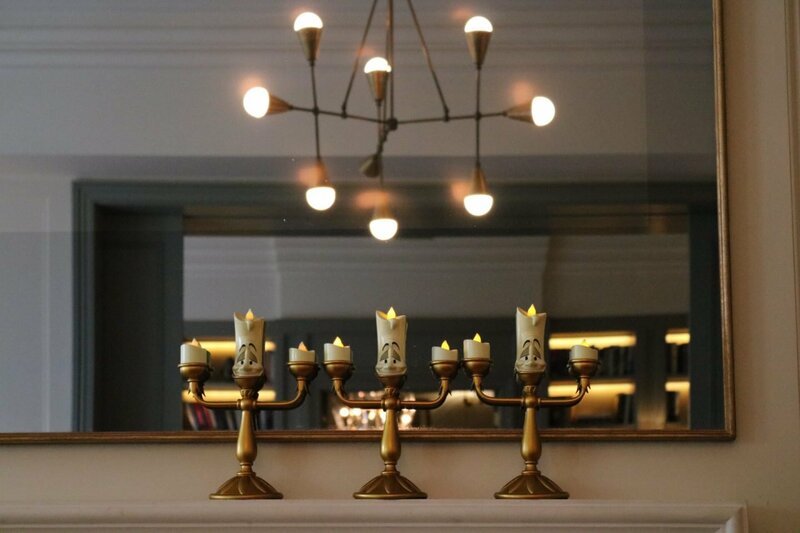 As we arrived in the gorgeous library room, I couldn’t help smiling at the Beauty and The Beast memorabilia scattered around the room such as Lumiere and Cogsworth figurines. The Afternoon Tea’s theme is taken from the “Be our Guest” scene in the story and is a French twist on the classic afternoon tea. On the bottom tier, as a nod to Belle’s baking skills, were French brioche baguettes in lieu of traditional scones. These were accompanied by Apricot preserve and chocolate. On the dessert tier there was a Vanilla and Gold Jelly (clear with a rose petal in, to emulate the rose in the bell jar) served with double cream poured from Mrs Potts herself. There was also a chocolate Tart in the shape of Cogsworth, a White Chocolate Mousse topped with ‘Grey Stuff’ (which was cake frosting) inside a Chip teacup and a Spiced Snowball Macaroon with Coconut and Chocolate. The grey stuff was really delicious and it was cake icing. What’s not to love! It reminded me of naughty indulgent moments when baking cakes myself, and scoffing all the icing. My only minor dislike was the French brioche baguettes instead of the scones as for me scones are my favourite part of an afternoon tea. I do completely understand why they were used though so if you like brioche then you would welcome this aspect. They were delicious – I just really fancied scones! The treats didn’t end at the stand though and we were handed a Belle’s dress Speculoos cookie each which was absolutely divine. We took it home and indulged in it later. It costs £35 per person or £45 with a glass of Champagne. Next Post Darjeeling Express – The restaurant! This literally looks the best thing ever!! I couldn’t get a booking either but really wanted to go! I’m so sad that I didn’t manage to get a slot for this tea, it looks like fabulous fun! Maybe they will extend it into next year seeing as it’s been so popular – a girl can dream! Hey lovely someone managed to get a last min slot for this Saturday so might be worth calling them! This is too cute! awwwww. Wish I were there. I’m also doing an afternoon Tea series here in KEnya. just two so far. Building up slowly. Check it out when you can.